Fish measurement are key in fishing regulations. Many state fishing regulations are based on fish measurement and length. Biologist using years of research have established rules that help protect a species while still allowing anglers to harvest a portion of the population. There are several factors which play a part in determining these rules. For example, the age at which a fish species begins to reproduce, or in biological terms spawns. The time of year and location the spawn occurs, the approximated number of spawning females, as well as the estimated number of fry (baby fish) to reach spawning age. Of course there are many other biological, environmental, and climatic effects to consider, but for most fisherman the question becomes is this fish legal to keep? Thus, the development of fish length measurements to help angler answer that question. Most states are fairly consistent when it comes to measuring the length of freshwater and fan tail saltwater fish using a method referred to as Total Length. 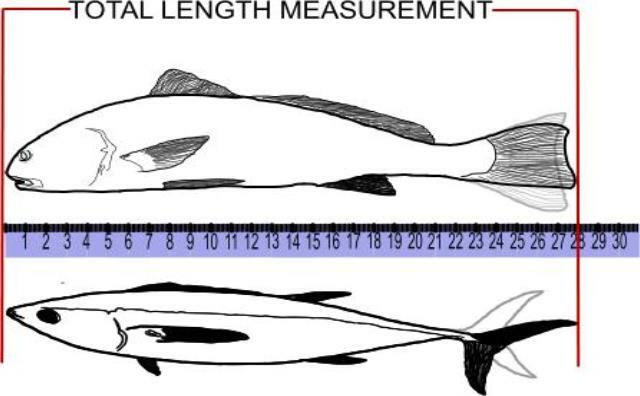 For fish measurement dealing with fan tails, total length is measured from the tip of the mouth to the end of the tail fin when pinched together. Examples of fish measured this way would included bass, redfish, black drum and flounder. State rules do vary however, on the measuring of saltwater fish with forked tails. 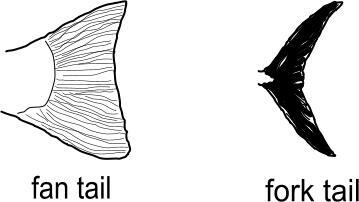 Some states measure the total length of a forked tail fish by using a curved fork length. Which simply means, measuring from the mouth to the tip of the upper fork when the tail is pushed down laterally with the body. Other states use the Fork Length method, measuring from the mouth to the fork of the tail. Examples of fork tail fish include spanish mackerel, cobia, bluefish, and billfish. Billfish such as marlin and sailfish are often measured from the lower jaw to the fork. Knowing how to get the proper fish length begins with knowing the regulations that apply in the state were you are fishing. Most often booklets are available, free of charge, at places were fishing licenses are sold. These booklets not only contain information on fishing rules but usually provide images that help identify fish. Also, these booklets may include information about fish tag and survey card programs. These programs allow direct input from you, the angler.